I finally went to Sturgis. I had passed through the town a few times, but had never been there during the rally. It wasn’t out of a concerted effort to avoid the rally, I had simply never found myself there. Typically I avoid crowds and I knew Sturgis would test my tolerance. The plan was to ride through on my way out to Colorado. I would be there during the opening stages of the rally and hopefully ahead of the crushing masses. Well, I made it in about ten hours of riding. Made a pass up and down Main Street, ate a giant pork chop, and headed for a campground in the Black Hills in Nemo, SD. After settling in for the night at Big Mama’s Campground, I wandered into their bar for a couple of post-ride beers. The place was abuzz with locals and rally goers. 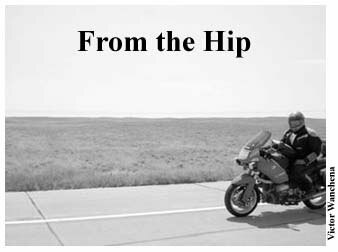 As the revelry went on, into the night, the topic around the bar turned to macho vs. wimp in the motorcyclist world. Being a journalist, I instantly smelled a column and took note. Plying the patrons with the promise of buying another round, I conducted an unscientific poll on the topic of what does or does not define someone a “real” rider. These are my findings. 1. If you have ever intentionally slept in a ditch or on a picnic table because you A) didn’t want to waste valuable riding time finding a motel or B) there were no motels within 100 miles, you are probably a “real” rider. 2. If you consider fording a deep water crossing or riding in heavy rain to be equivalent to washing your bike, you are probably a “real” rider. 3. If your diet on a road trip consists of what ever you can stuff in your mouth while wearing your helmet, or if you purchased a flip front helmet so you can eat and ride at the same time, you are probably a “real” rider. 4. If your definition of “good riding weather” involves a temperature range of -20? to 130?, you are probably a “real” rider. 5. If you need to replace your tires more often than you need a haircut, you are probably a “real” rider. 6. If your toolbox contains more brushes, chamois, polishing rags, and detailing equipment than it does wrenches, you are probably not a “real” rider. 7. If you have spent more on hair care products during the last year than you have on oil, chain lube, or tires, you are probably not a “real” rider. 8. If you have ever referred to your motorcycle as a “lifestyle accessory”, you are probably not a “real” rider. 9. If you put more miles on your riding lawn mower than your motorcycle, you are probably not a “real” rider. 10. If your definition of a “big ride” only requires a half-tank of gas, you are probably not a “real” rider. Thank you to the denizens of that bar for helping to clarify the on-going manly vs. wimp debate.